Dan Wheldon's death at the IndyCar Series finale at Las Vegas Motor Speedway on October 16 shocked the motorsport brotherhood. With a few weeks having passed since then, it's ime to take stock and reflect on the life of the two-time Indianapolis 500 winner. Charles Bradley assesses the contribution made by the lad from Emberton. 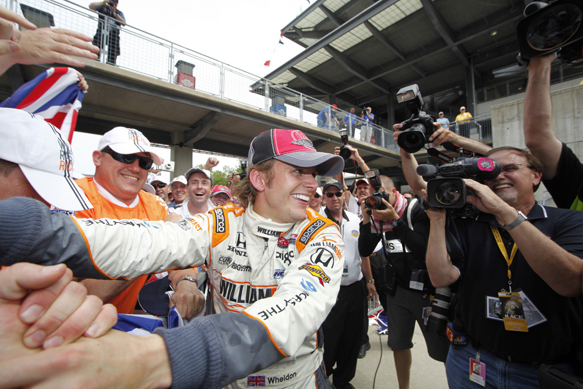 To complement this, US-based British scribe Jeremy Shaw tells the story of the September day this year at Indianapolis Motor Speedway, when Wheldon enthusiastically jumped aboard Indy Lights, Star Mazda and Formula 2000 racers to assess the IndyCar 'development' categories. 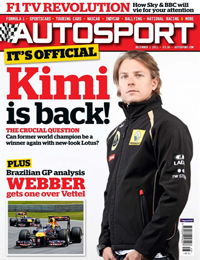 Raikkonen returns with Renault - AUTOSPORT revealed back in August that 2007 Formula 1 world champion Kimi Raikkonen was itching for a return to the sport, his world rally dream having run its course. And sure enough, the news was confirmed earlier this week with his signing for Renault. Our news team explains how the squad, which will be rebranded Lotus in 2012, will give the Finn as much time as it can in a 2009-spec car to ensure he's ready for the season-opening Australian Grand Prix in March. Mark Hughes column - Our resident grand prix editor wonders if, on the basis of the recent Abu Dhabi F1 test, we're in danger of letting a whole generation of talent slip through the net because of the teams' penchant for taking 40-something-year-old experienced hands. Brazilian GP report - When Sebastian Vettel's gearbox started going a bit weird on him, it allowed Mark Webber to take his maiden win of the 2011 season at the Brazilian GP. Mark Hughes tells the story of a remarkable performance in trying circumstances by Vettel, as well as assessing the other major occurrences. McLaren AUTOSPORT BRDC Award shootout - This Sunday evening will be the turning point in the career of one British driver, when the recipient of the 23rd McLaren AUTOSPORT BRDC Award is announced. One of the judges, Kevin Turner, brings us up to speed on the activities undergone by the six finalists: Emil Bernstorff, Tom Blomqvist, Alex Lynn, Scott Malvern, Oliver Rowland and Dino Zamparelli. Tony Stewart: Triple champion - Almost two weeks ago, Tony Stewart did what he'd done twice before – in a way he'd never done it: he won the NASCAR Sprint Cup, this time with his own team. He talks about his achievement with Stewart-Haas Racing with Andrew van de Burgt. Bottas interview - Valtteri Bottas is a young man with a big future. Glenn Freeman interviews the Finn about the risk of his sideways step to compete in GP3 this year (he won the title), and prospects of getting to F1 with Williams. From the archive - Roger Williamson and Tony Brise: two lost British talents to send shivers down the spine. Our 'From the Archive' features Brise at work in his F3 GRD in the 1972 Archie Scott Brown Memorial race at Snetterton, a race in which he chased Williamson home. Race of my life - There was one person who was ecstatic when Niki Lauda suddenly quit racing at the 1979 Canadian GP. Ricardo Zunino chooses his sudden call-up to the Brabham team as his Race of my Life.